Moms Touch | Top-Notch Cleaning, LLC. A Mothers Touch Cleaning Service. Top Notch Cleaning at least once a week will schedule a free detailed home cleaning for someone currently receiving treatment for cancer. Due to the vast need of these services we will rotate the cleanings with those we have on file to try and reach as many deserving individuals as possible. As Top Notch Cleaning continues to grow we will gladly expand A Mothers Touch cleanings. All cleanings completed under A Mothers Touch will be at no charge and the recipient will be under no obligation to use our services in the future. If the recipient or their family would like to schedule further cleanings we will gladly work with them to make it as affordable as possible. We do ask that all recipients be within a thirty minute radius of either of our offices (Bridgeport and Cambridge, OH). I want to take a moment to thank all of our valued Customers who have blessed us to the point where we can give back in such a meaningful way. 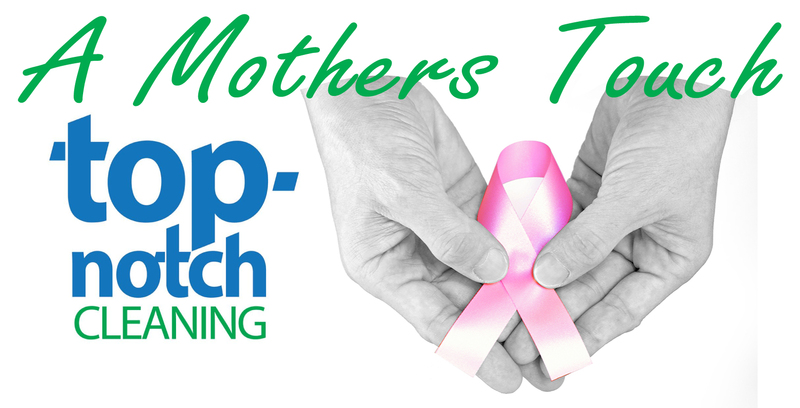 If you or someone you know is currently battling this horrible disease and would benefit from a Mothers Touch Cleaning Service please give us a call.